that with the world wide web being sooo big, sometimes it can feel so very small. I have made so many wonderful friends through this amazing hobby we all share, and I feel so blessed that I got to meet a bunch of them a couple of weeks ago in California. One of those people totally made my day today. As I opened my garage door this morning (since we are now in the middle of blizzard #2 in less than a week, believe it or not, and I still can't get out through my front door), I saw a Priority Mail box waiting for me on the ground. This box was chock full of brand new JBS goodies! The new Homespun papers, embellished butterflies, gorgeous vintage buttons, mini-papers, bingo cards, labels, stickers, stickpins all staring me in the face!! I had no idea where this box came from, but I soon found out that my so so sweet friend Doris sent it to me. Now, onto more scrappy stuff - I realized I never posted the rest of my Fancy Pants projects for CHA. 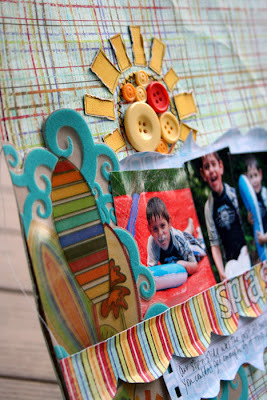 I made this layout with the Rusted Sun line - love these colors! The blue swirls and surfboards are cut from one of the new flocked transparencies, and that sun was cut from one of the journaling cards. Well, my friends, as I mentioned earlier, we're in the middle of our second blizzard in less than a week! While we still have 33 inches on the ground from the weekend, we were expected to get up to another 20 inches today! I'm not sure if it actually stopped snowing yet, so i'll have to venture into reality to find out what is going on out there lol. Hope you all are staying warm in your neck of the woods!! WOW! I can not imagine that much snow! Not even kind of! Loving those LO's and I can't wait to see what you create with JBS!!!! Love these sweet friend...such great colors and filled with yummy details.. I too am sitting in a house in which I cannot open the doors...So...I say when this is all over...you and I MUST MEET FOR LUNCH!!!! that much snow...wow...it is usually us in NH who are dealing with it and it has barely snowed here! i feel for ya big time! 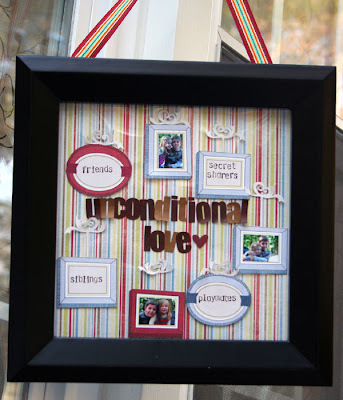 love your new layouts and that frame is gorgeous!! tfs and stay warm and cozy! wow ! that is so heartwarming to receive a JB box like that in your log cabin fever weather . ;) Hoping you & your fam will be warm & cozy & safe in that cold cold weather ! Beautiful creations all as always , Staci ! always eye candy ! hey sweet girl - sorry about all of that darn snow! I hope it goes away soon - the good thing is at least you have a good excuse to scrapbook - right - trapped in the house - no where to go! Great layouts!! that LO is absolutely sweet! I love the photos and the title! Now that is a true RAK!! Love all your projects too - gorgeous work!! 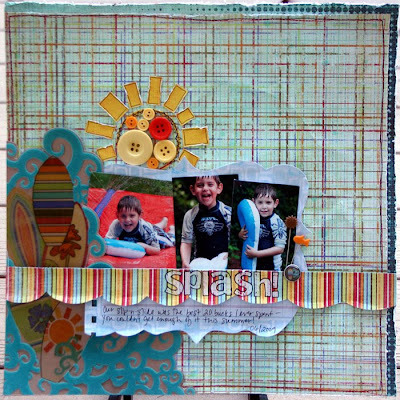 Your projects are gorgeous, Staci! Really love how you work the Fancy Pants! that is a lot of snow girl .. and to get such a surprise is SO SWEET aww .. wish I could have met you .. maybe next year .. I plan on coming back from UK just to go .. .. if I am still in it as much as I am .. even if just to say hi to folks I chat with online LOL. I'm so jealous! I love the Homespun collection - good luck with the snow, so glad it's not in the midwest anymore! Beautiful layouts Staci!! I love the super sweet pictures of the two kiddos!!! Sounds like you and the kiddos will be playing in the snow for a very long time! That's a ton of snow girl!! Have fun playing with your new goodies you received. LOVE these!!!! and how awesome that you got some JBS in the mail! gotta love that happy mail!! Lucky you for snow and JBS! Love your creations! It was so nice to meet you as well, Staci! I hope you are doing well and that baby bump is making a great big appearance! That's the best part! Can't wait to see what you do with the JBS! Yummy! Gorgeous projects!!!! Hey YOU! I love snow...but probably not in that quantity. LOL! Your creations are delicious...and hope you enjoy your new JBS goodies. Oh so sweet!